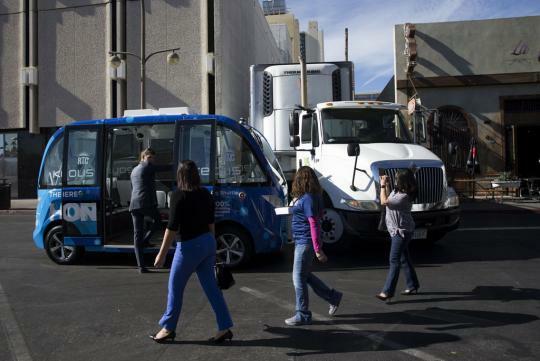 Within its first few hours of operation in Las Vegas yesterday (Wednesday), an autonomous shuttle bus that is part of a ballyhooed study of driverless vehicles on public roads was involved in a collision with a truck. No injuries were reported. Details from the incident are still emerging. Members of the Las Vegas Metropolitan Police Department have not commented on the collision or issued a report. Nor have officials from Navya, the French company that manufactures the shuttles. There were passengers on the shuttle when the crash took place, according to reports from KSNV-TV. A spokesperson for AAA, which is a sponsor of the study, says the shuttle was stationary when the truck struck the left-front side of the vehicle. 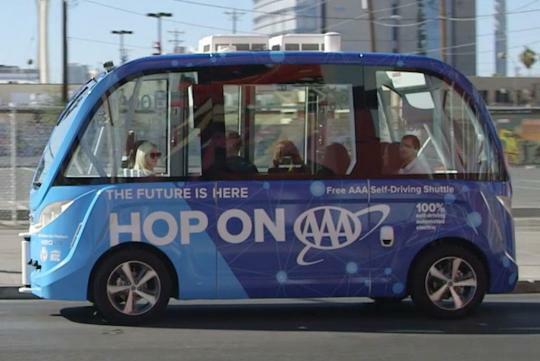 The shuttle, which is the first to carry members of the public, has no traditional vehicle controls such as a steering wheel or a brake pedal. But a human safety steward is aboard the shuttle and can stop operations with the push of an emergency button. During regular operations, the eight-passenger shuttle is expected to run on a fixed 0.6-mile loop in the Fremont section of the city, making three stops along the route. The shuttle will be taken out of service for the remainder of the day, but organizers expect to restart operations Thursday, according to city officials, who also stated that the driver of the truck was cited by police in a post on the city’s Tumblr page. The incident turned a celebratory atmosphere sour. Only hours earlier, Las Vegas had hosted a welcome party for the shuttle, with appearances from Las Vegas mayor Carolyn Goodman, comedians/magicians Penn & Teller, and race-car driver Danica Patrick. 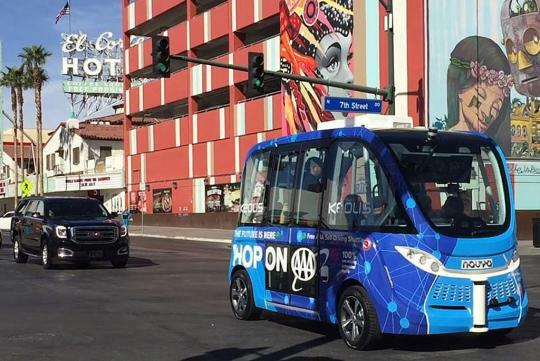 The electric shuttle, owned by mass-transit company Keolis, is touted as the first to integrate with traffic lights, which could help transportation officials learn ways to improve traffic flow. I must say the future doesn't look good.